The jolly Captain Toad finds renewed life with this expanded port, and deserves a first-second look. 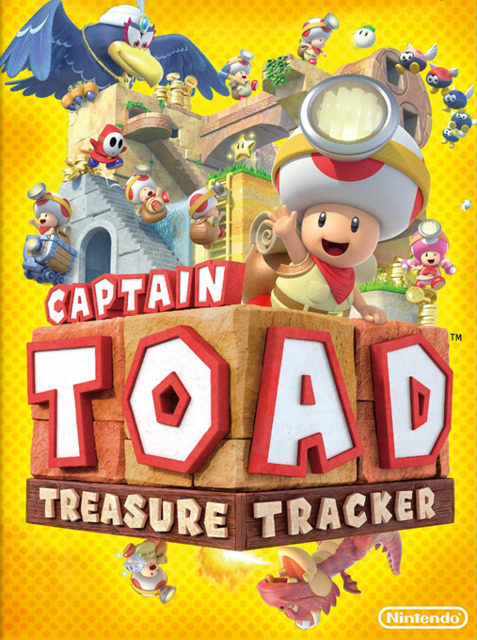 I remember Captain Toad: Treasure Tracker when I originally reviewed the Wii U version years ago. Well, it’s back, this time on a console that you probably have already. I’m not going to go on an soapbox tirade about Nintendo’s previous console failure, and the other forgotten or proclaimed “gems” that have since been ported over to the considerably more successful Switch. All that matters is that Treasure Tracker gets the re-release treatment and remains a solid puzzle-action game after all this time. This is especially good when you consider its humble origins as a minigame spinoff from Super Mario 3D World. The plot involves a star-hunting expedition with Toadette coincidentally getting birdnapped by a huge raven, and Captain Toad coming to the rescue while solving some brainteasing environments along the way. Our plucky explorer will plod from point A to point B, and exploration of every nook and cranny of confined spaces is highly encouraged. There’s no time limits to worry about and just being curious is a secondary reward since you’ll need to collect not only stars but diamonds to unlock pages in this storybook-styled adventure. Gameplay takes the needed cues and mechanics from the Mario universe, trouncing on enemies’ heads from above to defeat them, rooting up vegetables as throwable objects, and the twin cherries which splits our mushroom-headed hero into multiple copies. Otherwise, each stage is a self-contained diorama that can (and must be) viewed from every angle, which keeps discovery fresh and your mind ready when the goal ‘appear’ unclear. It not difficult but your surroundings can certainly play tricks on you if a stage is built upon numerous layers, or enemies like Bullet Bills or Shy-Guys seemingly hidden at every peril. The premise of Treasure Tracker is jovial by nature and doesn’t take itself too seriously, being downright refreshing whether you’re a gamer or not. Boss battles are about pushing forward and reaching the finish, where gargantuan brutes quickly become their own worst enemy. But there are some enhancements for Captain Toad that come with the Switch version, although if you’re one of the ten people who played this prior on the Wii U you won’t lose any sleep knowing this. On a technical level, the standard resolution is bumped up to 1080p when the Switch is docked (no surprises there) and locked to a native 720p when you go portable. The visuals continue to look vivid and full of life but you need a keen eye to notice edges and superficial details got a nudge overall, mostly because the game already looked great four years ago. Another change happens when the touch controls are substituted for an onscreen pointer with the JoyCon, which isn’t bad but a little awkward at first. This is a byproduct of the Switch being docked so there’s not much of a workaround, however, going portable will provide a similar experience like the Wii U tablet. Meanwhile, the two player co-op can be ignored since it’s nothing more than an exacerbated girlfriend mode (one person controls the camera and tossing turnips) that’s more annoying than helpful. Whatever else is left is supplemental in content, with the Amiibo figurines no longer being a requirement to unlock the Pixel Toad hide-and-seek minigame and four all-new stages based on Super Mario Odyssey (although you have instant access through compatible Amiibos). These stages are mildly interesting as you explore New Donk City, Cascade, Sand and Luncheon Kingdom. They offer a decent challenge, or at least have the potential to be real standouts if they weren’t so short. I certainly enjoyed scaling skyscrapers or making a mad dash up to Cookatiel’s soup pot, but they’re simple are more promotional than actually essential. Despite the minimal extras, Captain Toad: Treasure Tracker has aged well and remains a respectable experience on the Switch. If you’ve already played through the Wii U version then replay value will be harder to justify, because the general experience is unchanged besides the minimal extras. For everyone else, especially the majority who skipped Nintendo’s last console entirely, here’s a second chance to enjoy a agreeable puzzler-adventure on the big and small screen.